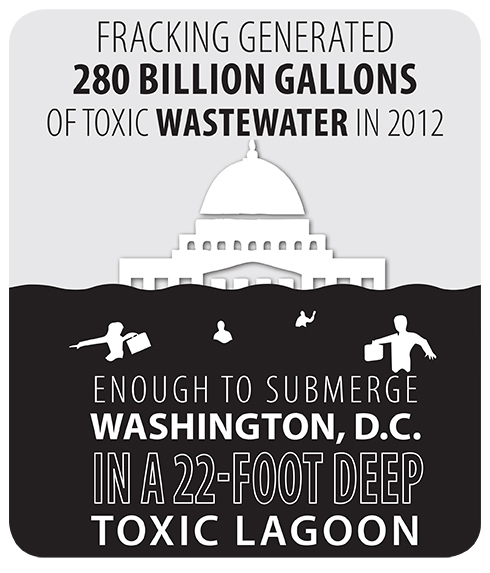 Washington, D.C. — As federal policy makers decide on rules for fracking on public lands, a new report calculates the toll of this dirty drilling on our environment, including 280 billion gallons of toxic wastewater generated by fracking in 2012 -- enough to flood all of Washington, D.C., in a 22-foot deep toxic lagoon. The Environment America Research & Policy Center report, "Fracking by the Numbers," is the first to measure the damaging footprint of fracking to date. • 100 million metric tons of global warming pollution since 2005. Fracking also inflicts other damage not quantified in the report — ranging from contamination of residential wells to ruined roads to earthquakes at disposal sites. Given the scale and severity of fracking’s myriad impacts, constructing a regulatory regime sufficient to protect the environment and public health from dirty drilling — much less enforcing such safeguards at more than 80,000 wells, plus processing and waste disposal sites across the country — seems implausible. In states where fracking is already underway, an immediate moratorium is in order. In all other states, banning fracking is the prudent and necessary course to protect the environment and public health. At the federal level, the report’s data on land destroyed by fracking operations comes as the Obama administration considers a rule for fracking on public lands, and as the oil and gas industry is seeking to expand fracking to several places which help provide drinking water for millions of Americans — including the White River National Forest in Colorado and the Delaware River basin, which provides drinking water for more than 15 million Americans.